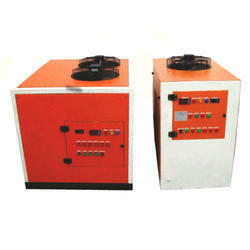 Pioneers in the industry, we offer industrial process chillers from India. Modern industry's increasing levels of sophistication and capital investment imply that highest precision with zero downtime is an absolute must for an economically viable process. Integrated Engineers & Contractors cooling solutions, developed specifically for industrial users, perfectly answer industry's need for precise temperature control and absolute reliability, 24 hours a day, 365 days a year. The cost of not implementing the optimized solution far exceed the cost of an optimized Integrated Engineers & Contractors industrial cooling solution. Technological innovation, absolute reliability and customer satisfaction have been Integrated Engineers & Contractors hallmarks in over 23 years in the industrial cooling market. The new Integrated Engineers & Contractors-ACWC air cooled chillers & Integrated Engineers & Contractors-WCWC Water cooled chillers, specifically designed for use in industrial applications, are compact units equipped, as standard, with a storage tank and pump, offering a tried and tested solution that has received worldwide acclaim. Integrated Engineers & Contractors-ACWC & Integrated Engineers & Contractors-WCWC chillers guarantee EER energy efficiency levels at the top of the category. The innovative Brazed Plate type evaporator- configuration ensures reduced ambient heat gain and a steady temperature of the process fluids. The use of components sourced from premium manufacturers and extensive factory testing of all units make for highest reliability levels, minimizing the risks of unplanned stoppages and increasing productivity levels. An extensive range of accessories, coupled with operating limits among the most generous available on the market, allow Integrated Engineers & Contractors-ACWC& Integrated Engineers & Contractors-WCWC to be personalized to a variety of industrial applications. BENEFITS Suited to all industrial needs; Brazed Plate Evaporator-configuration; Advanced digital control technology; Integrated Engineers & Contractors unique Frost Detection System (FIP version); Wide range of accessories and options for customized solutions. Thanks to an extensive product line-up for small to large-scale facilities, you can select your optimum model. Utilizing the latest technology, Integrated Engineers & Contractors has achieved industry-leading efficiency and energy-saving operation for outstanding cost-saving performance. Integrated Engineers & Contractors supplies chillers with high quality and efficiency, designed to respect and love the environment. Looking for “Industrial Process Chillers”?